Now I’m pretty sure than plenty of us live in highly stressed environments, especially with the workplace getting more and more rigid while the cares and concerns of the world tends to overcome us. 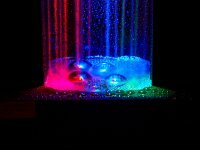 Why not take a back seat and relax with the USB Illuminated LED Waterfall Cloud Fountain on your desk? This will definitely add a touch of zen to your home/office/bedroom, as you play back relaxing soothing music while holding a mug of your favorite beverage in one hand while just letting all the stress melt away. It can be powered via three AA batteries or hooked up directly to any available USB port. Guess a highly strung dad deserves this $24 device for Father’s Day, eh?